Baby chicks start arriving at Bar None Country Store in the next few weeks. 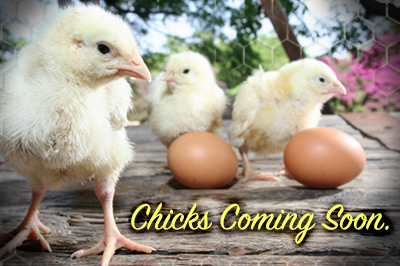 We have everything you need to care for your flock, chick starter, heat lamps and bulbs, feeders, waterers and much much more! This entry was posted on Thursday, January 29th, 2015 at 9:31 pm	and is filed under Chicks, Events, News & Updates. You can follow any responses to this entry through the RSS 2.0 feed. Both comments and pings are currently closed.